The Stompers’ Jordan Robes delivers a pitch to the Lemon Heads’ Ray Lutick during the championship series with ERL’s Connor Young providing commentary in the background. Six months ago, Mid Atlantic’s sophomore season commenced with the 8-team Opening Day tournament. In The Drop’s recap of that event, we highlighted the well-balanced nature of the field by noting that thirteen of the tournament’s fifteen games were decided by three runs or less. As it turned out, that level of balance and competitiveness would be a staple of the 2018 MAW season. It is only fitting, therefore, that the Mid Atlantic Championship Tournament – the culmination of the MAW summer season – was yet another tournament decided by the thinnest of margins. Of the thirteen games played on Saturday, eleven were decided by three runs or less. Two of the three 3-game series went the distance, a trio of games required extra innings, and the eventual runners up were one out away from losing their very first game of the day to the one team that went winless in the tournament. From the very first pitch of the day to the very last, there was little margin of error for any team or any player. The Barrel Bruisers’ Jerry Hill delivers a pitch while teammate Tony Manelli gets set in the infield. The tournament format ensured that one team – and only one team – would leave York without a win. While the smart money was on that team being the Barrel Bruisers – which ultimately would be the case – no team better exemplified the nail-biting nature of this tournament. Bucking conventional wisdom, captain Jerry Hill took the ball in his team’s first game against the Lemon Heads. When the Lemon Heads’ Tim Beck allowed a pair of runs in the first – and was quickly removed in favor of Ray Lutick – Hill recognized a big opening to pull off an upset. At a stage where most wifflers are putting their plastic balls away for good, Hill has quietly and steadily grown into a solid pitcher. 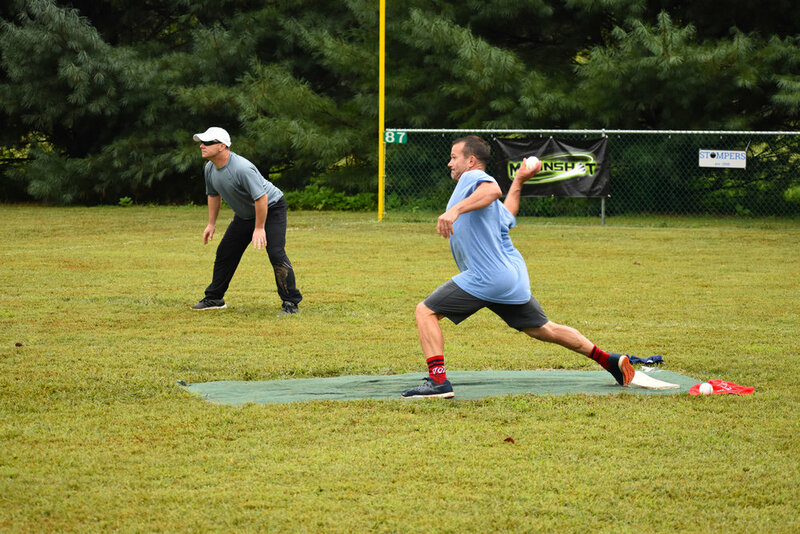 Working out of the stretch and relying heavily on a three-quarters drop, Hill pitched the game of his Wiffle Ball life against the Lemon Heads, holding them scoreless through three innings while the Bruisers clung to their two-run lead. A familiar refrain for the Barrel Bruisers this year has been their inability to close out games late. Unfortunately for them, that refrain would play out one more time this season. In the 4th inning, the Lemon Heads put together a string of patient at bats, which led to their first run of the game. With the bases loaded, Hill only needed a single out to pull off the shocker but issued a game tying walk instead. Jerry rebounded immediately by getting the final out of the inning and escaping another jam in the 5th, but the damage had already been done. The Barrel Bruisers dropped their opener on total bases and couldn’t muster up any magic against the Yaks, exiting the tournament in two games. One out removed from pulling off a major upset to two-and-done, the Bruisers will carry that sudden turn-of-events with them all winter long. However, their tournament – as brief as it was – is also a testament to the their tenacity and competitive nature. Dylan Harshaw of the Longballs digs in during a semi-final series game. In the Championship Tournament preview, we pointed to the Ridley Park Longballs’ depth as their greatest strength and the major reason why they had a chance at winning it all. The Longballs didn’t disappoint in that regard, steamrolling through the double elimination portion of the day thanks to contributions from all four team members. In going 2-0 and grabbing the #3 seed, the Longballs took down both the York Yaks and Lemon Heads. Although the games were anything but, the Longballs made those early games look easy through a combination of shutdown pitching and timely hitting. Sean Bingnear – the 2018 MAW Rookie of the Year runner up – handled a tough Yaks’ squad with the command and poise of a veteran. The Yaks took quality swings against Bingnear from the first pitch to the last, but the hard throwing righty continually found ways to get them out. The fact that the Longballs were so willing and able to use their best arm in the first game was, if nothing else, a testament to their ballyhooed depth. Southpaw Tyler Nachbar picked right up where Bingnear left off when facing the Lemon Heads in game two. Nachbar – with one win against the Lemon Heads already on the season – allowed his opponents very few scoring opportunities and pitched his team to a narrow 1-0 win. Although Nachbar and Bingnear are considered rookies for MAW award purposes, the poise they showed in pressure situations on Saturday is a direct result of their years of experience in the Ridley Park Wiffleball League and their national experience at the NWLA Tournament. All the shutout innings in the world from Bingnear and Nachbar may have been for not if it wasn’t for the clutch hitting of their teammates, Dylan Harshaw and Colin Pollag. Harshaw got the scoring going with a two-run opposite field blast off a game Jared Laird in the Longballs’ opener. Against the Lemon Heads, it was the Colin Pollag show. Pollag hit Ray Lutick as well as any player all tournament long, picking up three hits including a solo shot. The solo home run – a no doubter that Colin pulled over the left field fence on Buffalo – held up as the game winner. So good was Pollag against the Lutick that late in the game Ray decided to intentionally walk Colin rather than risk any further damage. Although the Longballs’ bats could not solve Chris Sarnowski in the semi-finals – leading to a quiet exit in the semi-finals – the Ridley Park crew were the most impressive of any team in the opening round thanks to their vaunted depth. If the Longballs add Tommy Loftus to their MAW roster next season – which they are rumored to do – that depth is only going to get deeper and scarier. First year Yak Adam Milsted delivers a pitch to the Bruisers’ Jerry Hill in the day’s first elimination game. In the finals of the repechage bracket, the York Yaks’ Adam Milsted was cruising right along through the first 2 2/3’s innings. Sure, the Yaks’ offense still had that pesky task of trying to figure out how to score off Ray Lutick but it looked as if Milsted was going to give the offense ample time to figure Ray out. Games could – and did – change in an instance all day long, however, and Milsted was about to experience that firsthand. With two outs in the third, Milsted temporarily struggled with his mechanics and issued what looked to be a harmless walk to Lutick. One minute and one Dave Clark double later, that walk no longer looked so harmless. Just like that, the Yaks were staring down the barrel of elimination and were indeed knocked out not too long after. It was that kind of day for the hometown team. Jared Laird appeared to have a little extra giddy up on his pitches against the Longballs, but a walk and well-timed home run did him in. The Yaks left the tournament with a +5 run differential, but that matters little when two games are lost by a combined margin of 3 runs. Milsted and Laird pitched reasonably well, but runs were hard to come by for the Yaks on this day. A key hit here or there from the Yaks’ hitters and the 2018 Championship Tournament may have played out in significantly different fashion. With a steady rain falling around him, Connor Young (My Name is ERL) goes into his patented windup. Nobody can win on will alone. I know this to be true. But I would be lying if I didn’t admit to momentarily questioning that fact while watching Connor Young play in game two of the semi-final series. The Championship Tournament did not go as the top seeded My Name is ERL planned. Pitching in a steady rain, Rookie of the Year winner Blake Hoffman struggled early in the first semi-final game against the Lemon Heads and got the hook before he ever got a chance to redeem himself. ERL’s offense struggled all game and a straight two-game sweep did not seem out of the question at the time. Young, however, would not allow that to happen. He returned for game two – after a lengthy pause in the action – with even more steadfast resolve than he brings to a “normal” game. Soup pitched a brilliant game, exploiting whatever little holes could be found in the Lemon Heads’ lineup while waiting for his pitch at the plate. That pitch finally came in the top of the 7th inning with only one frame left to be played before the total bases tiebreaker kicked in. Young got a hold of a Lutick drop pitch and hit it out over the season awards wall in right-center – Young’s go-to home run spot on Sheff. Screaming out “I told you I’d get mine!” he returned to his bench and focused on finishing off the game. In the bottom half of the inning, Young made quick work of his opponents, punctuating the final strike out with a fist bump while loudly letting everyone know that he still had plenty left in the tank. In the moment, it certainly seemed like Young would push his team into the finals any way possible. If winning was as simple as willing it into existence, Young and ERL almost certainly would have taken the third game of the series. It never is, however, and despite Young’s heroics and positive energy, ERL was bounced from the tournament before the championship series. Ray Lutick of the Lemon Heads - shown here pitching to Colin Pollag - was named tournament MVP. When MAW organizers put together the format for the six-team Championship Tournament prior to the start of the season, there was some concern about a team potentially playing nine games in a single day and the impact that might have on their pitchers. In the end, MAW concluded that it would take a perfect storm for that to happen. That team would have to start in the double elimination bracket and go two-for-three every single round, which from a pure odds standpoint was a long shot. In the unlikely event that storm occurred, surely that team would have to be at least three pitchers deep to get that far and thus there would not be too much strain placed on the arm of any one pitcher. The problem with that logic was nobody took the Lemon Heads and Ray Lutick into account. After a near loss to the Bruisers, the Lemon Heads weren’t as lucky against the Longballs and dropped to the loser’s bracket, thus ensuring they would play the maximum three games during the opening round. In getting by the Yaks, the Lemon Heads officially reached the semi-finals, but it would have been a stretch at that time to state that they had any significant momentum on their side. After all, they had scored just one run in three games entering the series with ERL. That didn’t matter one bit to this New Jersey-based club as they knew that with Ray on the mound, one timely hit per game was all that was required – momentum be damned. The Lemon Heads, of course, are by no means a one-man team and that showed as the day progressed. Dave Clark had the game-defining hits against the Yaks and in game one of the ERL series. Tim Beck had the game winning hit in the third game against ERL and then he took Jordan Robles deep early in the first game of the finals. Ray’s pitching and the Lemon Head’s timely hitting helped create the aforementioned perfect storm whereby the Lemon Heads won when they got a timely hit and lost when they didn’t, resulting in the team playing the maximum number of games in the day. Somehow Lutick’s right arm stayed in one piece through it all. Throwing the bulk of all nine games his team played, Ray racked up an unbelievable number of innings and strikeouts on his way to the tournament MVP award. The Lemon Heads long day is – in one respect – a once in a lifetime run. It is almost certainly not, however, the last time the Lemon Heads will be in the finals of a major tournament. And the scary thing is, this team is only going to get better. The Stompers’ Jordan Robles awaits a pitch during the Championship Series. Robles had a big home run and threw 18 quality innings in the series to pick up a second straight title for his team. The Stompers franchise celebrated its 20th anniversary this season. After a rare crooked number win, the longest tenured members of the team will often joke that winning in that fashion is not “the Stompers’ way”. No matter the roster – which has obviously changed over the years – the Stompers have long made a habit out of making things hard on themselves. For a team that made its name on winning ugly, the 2018 Mid Atlantic Championship turned out to be an appropriately themed anniversary gift. The defending Mid Atlantic champions slogged through the rain to take two straight games from the Ridley Longballs thanks to two more shutout performances from Chris Sarno in a season full of them. The mere presence of rain was itself a reminder of the team’s past, as the franchise’s memorable 2003 postseason run took place almost entirely in wet conditions in both New Jersey and Texas. With a fresh Jordan Robles on the carpet to start the finals, the Stompers felt good about their chances, but those good feelings went away in an instant courtesy of Tim Beck’s second inning home run. Just like that, the Stompers had their backs against the wall. The outlook improved slightly with a win game two, but even that was a drawn out contest marred by a disputed tag play. Speaking of long and drawn out, the deciding game of the series felt – at times – as if it would never end. The ever dangerous Chris Sarno was issued intentional walk after intentional walk, but the other Stompers’ failed to get him in. From the second inning through the seventh, the team had bases loaded each inning but failed to score. To the Stompers’ credit, Robles kept the Lemon Heads at bay and was never in serious danger of being scored upon in the third game. At long last – and appropriately enough – Stomper founder and captain Tim Cooke poked a Lutick dropper into centerfield for the game-ending single. The path to a second straight Mid Atlantic title certainly wasn’t pretty, but then again with the Stompers, it rarely ever is. Although the champion remained the same, there is no doubt that the 2018 Mid Atlantic Championship was a significant step up from the 2017 iteration. From the cash purse - up $1,200 to $2,500 - to the robust live streaming schedule and the previously mentioned high level of competition, everything was a little bit bigger and better this September. Even the rain couldn’t dampen what was a an excellent day of wiffs and a fitting end to a quality season in the Mid Atlantic. MAW officials would like to thank all of the Championship Tournament teams as well as every single team and player that competed in a Mid Atlantic tournament this season. Planning is already under way for the 2019 season, which will be here sooner than you think . . .
A memorable and competitive summer of Wiffleball in the Mid Atlantic area comes to a head on Saturday, September 8th at the second annual Mid Atlantic Championship tournament! The six teams that have earned their way to this point will compete for $2,500 in cash prizes and the title of 2018 Mid Atlantic Champions. The teams competing on September 8th participated in multiple Mid Atlantic regular season tournaments, accrued points based on their finishes in those tournaments, and placed in the top six in the final point standings. The Championship field is a mix of veteran teams and players, several of the best players in the sport, and a plethora of up-and-coming players that – if they aren’t already – will very soon be on radar of every serious wiffler. For ongoing team-by-team previews, see below and continue reading beyond the jump for a full run down of what you can expect to see on the 8th in York. The 2018 Mid Atlantic Championship Tournament is the culmination of a six-tournament regular season that began on April 14th in York, PA and wrapped up on August 18th in Canonsburg, PA. This is the second year in a row that MAW will host a championship tournament. The Stompers outlasted My Name is ERL, York Yaks, and Barrel Bruisers to win the 2017 Mid Atlantic Championship last October. The Championship Tournament field expanded from four teams to six teams prior to the 2018 season to account for the increased participation in Mid Atlantic tournaments. The top six teams in the point standings – as listed in the graphic above – all accepted their bids to the Mid Atlantic Championship Tournament and will be in action on the 8th. As announced prior to the start of the 2018 season, the six-team Championship Tournament format provides byes to the top two teams in the point standings – the Stompers and My Name is ERL. The remaining four teams will compete in a modified double elimination bracket to determine the 3rd and 4th seeds for the Best of 3 semi-finals. This is a double elimination bracket with one exception – the winner of the champion’s bracket and repechage bracket will not face each other. Instead, the team that goes 2-0 will become the #3 seed in the semi-finals and the team that goes 2-1 will become the #4 seed in the semi-finals. The other two teams will be eliminated from the Championship Tournament. The games in this opening round will be four inning regulation games. Home field advantage and the right to choose which field to play on during this round will belong to the highest seed. The Yaks, therefore, will hold home field advantage throughout this round. The semi-final round will kick off around noon with the Stompers (#2 seed) facing the team that comes out of the winner’s bracket and My Name is ERL (#1 seed) facing the team that comes out of the repechage bracket. The winners of these two Best of 3 series will meet in a Best of 3 championship series. All semi-final and championship series games will be five inning regulation games. Seeds will re-reset for the semi-finals and finals, with the team that comes out of the winner’s bracket assuming the #3 seed. The higher seeded team in the semi-finals and finals will have home field advantage in games one and three (if necessary), with the lower seeded team being home in the second game of each three game series. Games will start at approximately 9:00 AM ET. 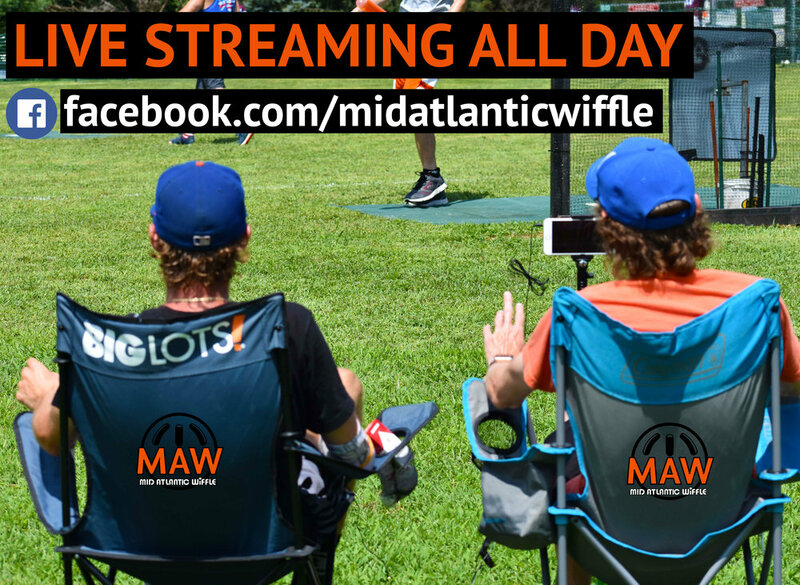 For those who want to follow along, MAW will go live on Facebook (www.facebook.com/midatlanticwiffle) at approximately 9:00 AM with the Longballs vs. Yaks game. The broadcast will continue straight on through to the winner’s bracket game, which will decide who will face the Stompers in the semi-finals. The morning broadcast will include commentary. In the afternoon, at least one semi-final game and one game in the finals will be streamed live. Follow the MAW Facebook page and MAW Twitter (@midatlanticwiff) to make sure you don’t miss out on any of the live action. In addition, the 2018 Mid Atlantic regular season award winners will be announced in between the double elimination round and the semi-finals. Who is this year's Mike Palinczar Most Valuable Player award winner and this year's Joe Nord Rookie of the Year winner? Find out on the 8th! The final tournament of the season is just two weeks away and the Mid Atlantic Championship Tournament picture is coming in to focus. However, there are still plenty of moving pieces and potential spots up for grabs in Canonsburg, not to mention the Auto Bid that goes to the winning team of that tournament. To recap, the top two teams in the point standings after the 18th will receive a bye to the semi-finals of the Championship Tournament. Seeds #3 through #6 will compete in a modified double elimination tournament (i.e. no final game between the winner’s bracket champion and the loser’s bracket champion) for the other two semi-final spots. The semi-finals and finals will then be best two-out-of-three series. Click here for an example of the Championship Tournament format. After Backyard Brawl, there is a new name atop the leader board. For the first time this season, a team other than the Stompers occupies the top position. My Name is ERL made up a 10-point difference in one tournament by finishing first while the Stompers sat inactive. Both the Stompers and ERL have clinched a spot in the Championship tournament but both teams will be on action on August 18th. The Stompers have a lot of work to do – and will need some help – to regain the top position. Mathematically, the Yaks could still overtake the Stompers for the coveted second spot but as of this date are not expected in Canonsburg. The Yaks have clinched the third seed in the Mid Atlantic Championship Tournament. 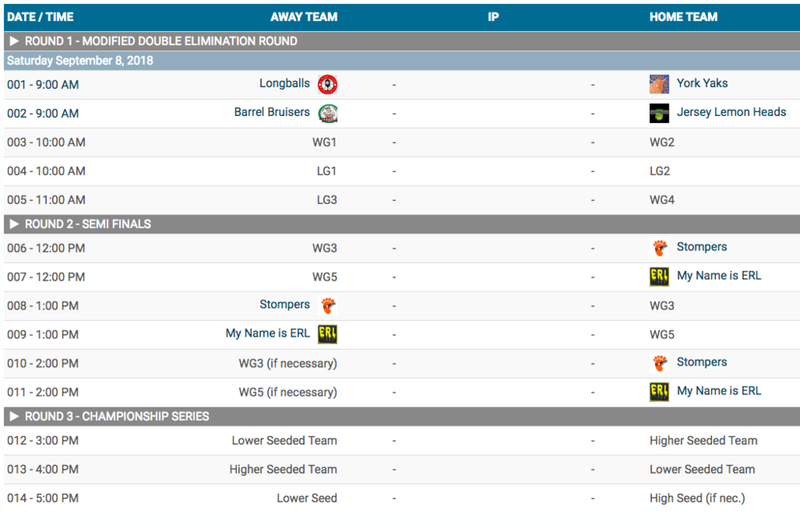 None of the other teams currently in the top six – the Barrel Bruisers, Longballs, G€M or the Lemon Heads – have clinched a spot. The biggest shake up to the Championship Tournament could occur if the winning team in Canonsburg is a team other than one of the seven listed above and that team accepts their auto bid. Under that scenario, the Lemon Heads and/or G€M would find themselves on the outside looking in if they are inactive on the 18th. Similarly, there could be some movement among the final four seeds depending on what happens on the 18th. The season is going to go right down to the wire. Which teams will be tempt fate and which ones will try to take matters into their own hands in Canonsburg? We will find out in two weeks!